Our long Capsnational nightmare if over. Today the Caps take their first step on a long journey that we all hope ends in a parade down Pennsylvania Avenue. Today will see Groups A, B, and C take the ice for the first time to get their legs under them, but tomorrow, Kettler Capitals Iceplex will play host to the first contest in one of the storied intramural tournaments in the greater Washington metropolitan region – The Duchesne Cup. The Duchesne Cup is the brainchild of Coach Bruce Boudreau, who conceived the award and the tournament to add a wrinkle to training camp in 2008. 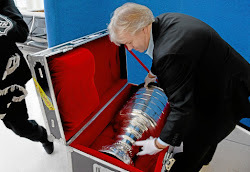 The Cup is named for Gaetan Duchesne, who played for 14 seasons in the NHL, six of them with the Capitals. In his six seasons in Washington, Duchesne played in 451 regular season (87-138-225, plus-68) and 33 playoff games (10-6-16, plus-7). He played in a Stanley Cup final with Minnesota in 1991 in his next-to-last season in the NHL. He left us far too early, a victim of a heart attack at the age of 44 in 2007. 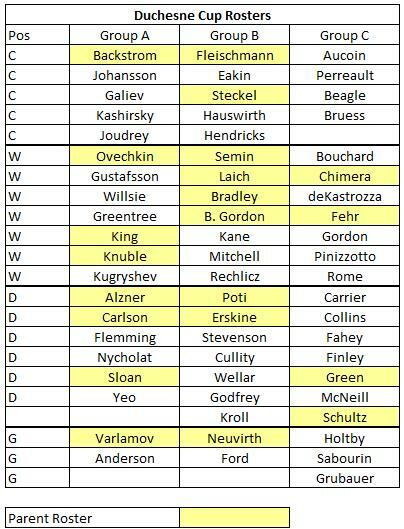 If one is handicapping these rosters, the clear favorite at the top of the round-robin play would have to be Group A, which features the top line of Alex Ovechkin, Nicklas Backstrom, and Mike Knuble. It also features the whiz-kid pair on defense, John Carlson and Karl Alzner. Backstopping this talented group is Semyon Varlamov. 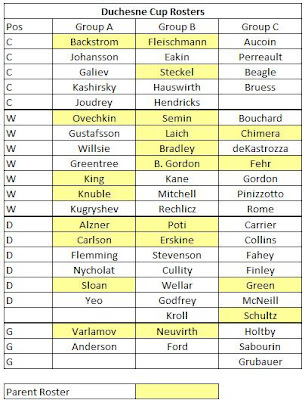 Group B brings a certain flair to the proceedings with Tomas Fleischmann and Alexander Semin at forward, Fleischmann presumably getting the nod as the top-line center for this group. The grit will be provided by Matt Bradley and Brooks Laich. Tom Poti and John Erskine lead the blueliners, while Michal Neuvirth is likely to be the featured goaltender. Group C has a distinctly Hershey flavor to it with Keith Aucoin, Mathieu Perreault, Jay Beagle, Francois Bouchard, Andrew Gordon, and Steve Pinizzotto at forward. The Group C boys will have last year’s top defensive pair of Mike Green and Jeff Schultz skating for it, though. The likely Hershey goaltending duo of Braden Holtby and Dany Sabourin will skate for this group. Group A might have a prospect line of Marcus Johansson, Anton Gustafsson, and Dmitry Kugryshev skating behind the Backstrom line. For Johansson and Gustafsson this is an important camp, but for different reasons. 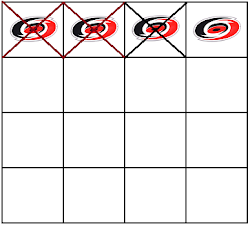 Johansson is battling for the second line center spot (perhaps the third line). He and Mathieu Perreault are fighting for what could be the same roster spot in this camp. Gustafsson is fighting for credibility. He hasn’t really impressed in his Kettler ice time over the past two years, and this camp might be a means to demonstrate that he can be a fixture in Hershey this season and that he has a future in this organization. Are Group A defensemen Carlson and Alzner an item? As in, can these two be a pairing that goes further than training camp – to the pre-season games to follow and perhaps into the season? Tomas Fleischmann has a bright light shining on his centerman play now. He is apparently the front-runner for the second line center spot on this team, and while his play in this intramural tournament as the top line center for Group B won’t secure him that spot, it might be an early indicator if he has the complete game to handle the load at that position. Cody Eakin is something of a dark horse to make the roster, but he has been impressive in his appearances at Kettler to date. He has offensive skills, and he is fearless in skating in traffic, despite lacking size. His chances of making the roster for opening night might not be great, but they cannot be discounted, either. Michal Neuvirth comes into camp as the number two goalie, a position he has had relative to Semyon Varlamov since he was drafted. But, he is arguably the more accomplished of the two in his tenure with the Caps to date. Coming out of the blocks sharp as the Group B netminder could tighten up the goalie race. Can Mathieu Perreault take the last step to a permanent roster spot with the Caps. He has come a long way forward in the past couple of years and was impressive in his short stint with the Caps last season (21 games, 4-5-9, plus-4). He and Johansson might be fighting for the same roster spot, and if he can help propel Group C to a Duchesne Cup, it only helps his chances. Francois Bouchard is the forgotten prospect. But in three seasons in Hershey he improved his goals, assists, points, and plus-minus in each season. Last year he was fifth-leading scorer for the Bears (21-31-52, plus-21 in 77 games) and added five goals and ten points in the Bears’ Calder Cup run. He is almost certainly not going to make the Caps roster to start the season, but this will be a good barometer to gauge how much he has improved. Andrew Gordon might not be thought of generally as a lock, or even likely as a parent roster player on opening night. But the Halifax, NS native turned into a scoring machine at Hershey last season (37 goals in 79 regular season games, 13 goals in 17 playoff games). A big camp is going to give him a chance. If nothing else, he might end up being the first among the call-ups during the season when circumstances dictate a replacement. Group A in a shootout over Group B on Tuesday.